Sightseeing company finds that propane autogas is a long-term solution to offering safer, greener ridesHistoric Tours of America operates 251 total vehicles — from trolleys to shuttle buses — to entertain more than two million guests annually on historic tours of Boston, Massachusetts; Key West and St. Augustine, Florida; Savannah, Georgia; San Diego, California; and Washington, D.C. 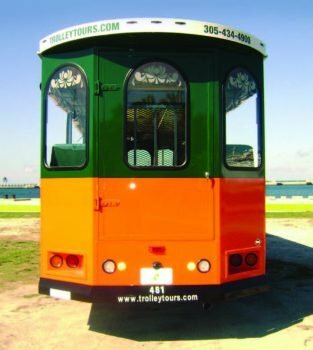 The company has converted 165 tour vehicles, including trolleys, buses, and its iconic Conch Tour Trains, to run on propane autogas. “In our business, it’s a major benefit to operate cleaner vehicles,” said Joe Moyer, national transportation manager for Historic Tours. Moyer spearheaded efforts to convert all of the tour vehicles to propane autogas when he started with the company in 1980. One of the reasons, he said, was because of propane autogas’ impressive emissions profile compared to diesel fuel. Many of the vehicles are open-air, designed to give tourists the best views as they learn the history and culture of each community. Propane eliminated the discomfort of breathing in diesel or gasoline fumes and exhaust. “Our guests notice the difference when they’re riding with us,” Moyer said. The World Health Organization, as well as the Environmental Protection Agency, have identified diesel engine exhaust as a carcinogen, which can cause short- and long-term health effects. Unlike diesel vehicles, propane autogas vehicles will not expose passengers to that same harmful particulate matter found in diesel exhaust, which is known to escalate breathing related issues and aggravate asthma. Propane autogas helps the company breathe easier, too, because it complies with environmental regulations in all the cities where their fleets serve. California, for example, employs the most strict environmental regulations of any state, but running propane autogas allows Historic Tours’ San Diego fleet to keep operating without any issues. Washington, D.C. has anti-idling and emissions regulations for vehicles, and Key West, where the company had its start, has instituted greenhouse gas reduction measures to raise awareness of the impact of rising seas on the island. In fact, 2006 data from the Florida Department of Transportation shows that Historic Tours’ use of propane autogas decreased carbon dioxide emissions by 45 percent compared to what the company would produce using diesel vehicles. It wasn’t just the environmental benefits that encouraged Moyer to convert Historic Tours’ fleet. The peace of mind afforded to Moyer and his team because of the propane engines’ reliability has been immeasurable. The vehicles won’t break down mid-tour, he says, and when carrying several dozen passengers, it’s important that the tours aren’t hampered by mechanical trouble. “Our guests depend on us to have a good tour, and we depend on our engines to perform at an optimum level,” Moyer said. He said they’ve been very pleased with the performance of ICOM’s liquid propane injection system, which is used in all 165 propane-autogas-powered vehicles. The engine reliability has even extended the life of some of the fleet’s oldest vehicles, including the Conch Train that began touring around Key West more than 50 years ago and was converted to propane when it was acquired by the company in 1980. Additionally, propane autogas vehicles don’t compromise on horsepower or performance, offering equal torque and better throttle response compared to traditional fuel vehicles. Historic Tours’ fleet has fewer maintenance costs and less downtime because repairs aren’t needed as often. The cost of propane autogas is another advantage to the alternative fuel. On average, Historic Tours pays more than 60 percent less per gallon of propane autogas than gasoline. All propane autogas is delivered to private on-site refueling tanks at each of its locations across the United States. Moyer estimates that return on investment is reached within 12 months of converting a vehicle, with the combined savings from reduced maintenance, fuel costs, and also through available tax credits and incentives. Both Georgia and Florida offer tax credits for using alternative fuels, and credit can be claimed on federal taxes as well. Moyer said he applies for state-sponsored alternative fuel credits whenever they’re available.